Our video game event management team headed down to Orlando, Florida to work with Research in Motion, who owns/develops BlackBerry! 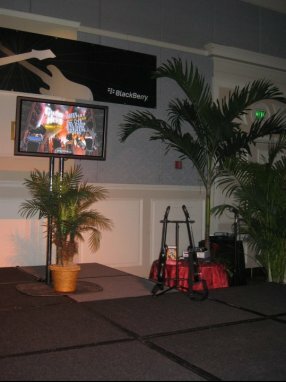 BlackBerry is hosting an evening event for attendees of the IBM Lotusphere 2009, which is being held one hotel down the Boardwalk, at Disney's Swan & Dolphin Resort. Our 2 hour event was at Disney's Yacht & Beach Club, where we had around 500 attendees. The Guitar Hero: World Tour element at this party was not the main highlight, but with awesome BlackBerry prizes, two interactive gaming stations, music playing, and up to 4-players rocking out at the same time, it was an important element and crowd pleaser that we were very excited to manage. We helped to manage the game play, help with prize distribution, and BEN made any necessary microphone announcements throughout the evening.